Doing 7000km on an open style motorcycle through various Australian eco-systems, terrain, climates and weather creates a unique challenge for selecting the right riding gear. A true to life Adventure Ride this would be so, naturally you think I would follow trend and get geared up in the latest gore-fiber-membrane-vented-textile-locator beacon jumpsuit, complete with high-vis and hyper-reflective striping. Problem is, I’m not big on following trends so getting kitted up to look like, lets be honest here people, an amateur snowboarding instructor isn't really my style. Nothing against those who do enjoy a bit of dress up role-play with their machines however, I believe that that there is an elegance in simplicity which heightens the whole experience so, I like to pick my riding gear as such. Still so Fresh and So Clean, Just East of Margaret River. That said, there are still some harsh realities to deal with in the pursuit of looking cool and making miles at the same time. The gear still has a job to do after all. Wind, rain, dust, mud, heat etc. all need to be taken into account. Also, thanks to a very generous Ducati Aus/NZ team, I would be riding a Scrambler Desert Sled so the lack of fairings and windscreen on our coldish southerly route were also important to consider. It quickly became clear that the most important piece of gear I would select would be the jacket. It could literally make or break the whole trip and after much research I simply couldn't go past the Merlin Rowan waxed cotton jacket. Stylish? Hell yes. Waterproof? Yes, Wax Cotton and Reissa membrane. CE Armor Protection? Yup, got that too. Hot/Cold? Removable thermal liner and vents, all present and accounted for. Enough of gear geeking, Lets Ride! But I wasn't. I was dry. Not a drop leaked into the jacket and my new super cool T-shirt was completely untainted by mother natures fury. I have to say I was sure I would see at least a bit of water make its way through but no, the Rowan was solid, warm and DRY. I was delighted to have this new found piece of mind with the thousands of km’s that lay ahead over the next few weeks. The next day with the Sled all loaded up, fueled up and my riding mates Scrambler cleared from customs, we headed out of Perth to kick off this epic journey across Australia via the southern costal route. The first 2 days were a mix of a bit more rain, wind, cool temperatures and some sunshine as we wound our way south to Esperance. After some shenanigans on the beach we set off on our planned cross country route to Balladonia. Outback, bush, remote, rough, dusty, rocks. All accurate words that describe this amazing place as we roared through it on our Scramblers. In such a rugged and harsh environment I was extremely pleased at how comfortable I was in the Merlin Jacket. So much so that I would often forget that what I was wearing it and just focused on piloting the sled around the puddles, holes, logs and psychotic homicidal kangaroos. Heaven. I should warn you that if you are going to wear any brand of waxed cotton garments off road, the dust will stick to them more readily than your typical materials. This can easily be cleaned up with a bit of cool water and a damp cloth/rag but for me, I left it alone. The patina of the day tells a story of adventure and experience. It invites people to approach ask about where you’ve been and where you are going. If you are like me, next to actually riding, talking about riding is my favorite thing to do so I wore this invitation with pride and told everyone I could about what we were up to. 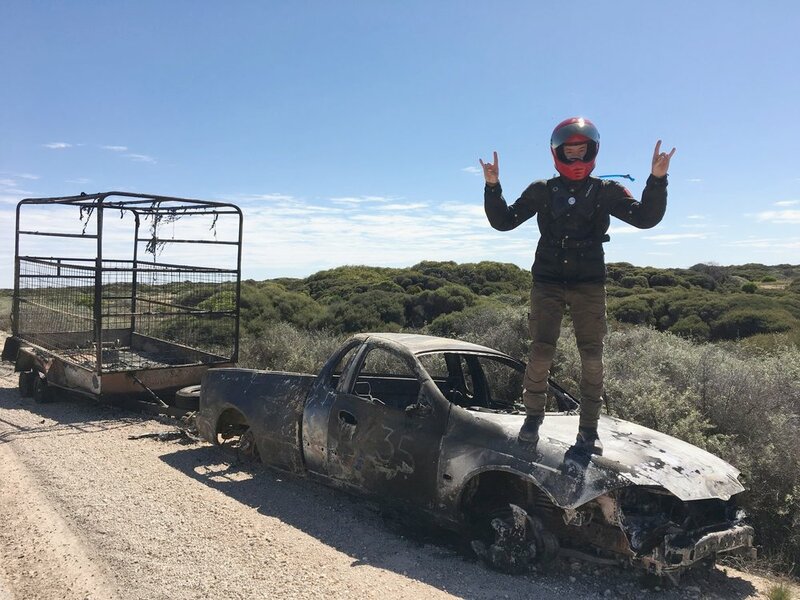 The miles added up as we smashed our way across the Nullarbor with daily riding temps going from 6c in the morning all the way up to 34c in the afternoon. As the weather heated up I began thinking that I should be a lot hotter and far more uncomfortable than I was. I was definitely warm but the breathable membrane and open style of the Desert Sled seemed to be a winning combination meaning there was no need to stop and adjust anything at all. We just kept on dodging the blue tongued lizards and turning petrol into distance. A bit later in the afternoon as the temps extended into the mid 30’s, my riding mate had an incident with an over pressured spare fuel can, leaving us doing some rather rushed ‘routine maintenance’ on the side of the road which definitely made the black color of the jacket and thermal liner first and foremost in my mind as we worked. Once the fuel crisis was averted, I took the opportunity to remove the thermal liner and open the vents in the shoulders. Setting off again in the seemingly relentless sun, the adjustments could be felt immediately and my core temp was brought back in check as we sped down the longest straight piece road in Australia. Luckily our fuel tank issue didn’t end up like this. Over the next few thousand km’s we would encounter more wind, rain, sand, dust, bugs, sea spray, sun, falling off’s and invasive foliage than many riders see all year. We wound our way through Adelaide, down the Great Ocean Road to Melbourne, into the hills and touching the snow line near Jindabyne then off to some beautiful weather in Sydney before finishing it all off in Brisbane. A cold and windy ride greeted us on the Great Ocean Road. Through it all the Merlin Jacket just kept going, never weakened, failed or even hinted that it may not be designed for this kind of thing. I didn’t baby it, or treat it in any special manner. In fact, quite the opposite. In addition to its normal duties, it was a seat in the salty sand while I ate lunch, got thrown in the corner of the many road house ‘hotel rooms’ at the end of each day, acted as a pillow in the tent and was crammed into too-small bags and luggage on more than one occasion, its padding being used to protect the fine single malt I was carrying for an ‘emergency’. It was honestly tough, effective and stylish throughout. After such heavy use/abuse and now back in New Zealand hanging on my personal gear rack, The Rowan will definitely get a well earned cleaning and re-waxing before heading out on more adventures. Admittedly most people who buy a Merlin Heritage jacket wont put it through the extremes that I have in such a short time but, just like the 4wd SUV in your garage that never leaves the city, isn't it nice to know you could if you wanted to?